Wooden decks can be exposed to extremely severe weather conditions. They're also subjected to abrasion and excessive friction from foot traffic. The horizontal surfaces of a deck, particularly the floor and handrails, get plentiful amounts of sunlight and moisture which causes continuous swelling and shrinking. The constant expanding and contracting can result in splitting, cracking, and splintering. A quality deck finish is recommended for protecting the wood from moisture and sun rays. Deck stains require occasional maintenance (normally every couple of years), but it's a better and more cost effective choice than letting Mother Nature lessen the longevity of the deck. Deck coatings fall into one of two categories. Film forming coatings such as primers, paints, heavy pigmented and solid color sealers are one choice. These types of deck coatings form a coat or film over the surface. They tend to be very time intensive and costly to maintain due to their nature. 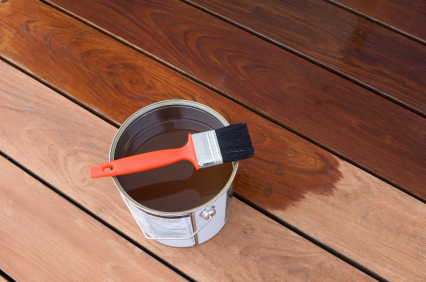 Cracking, flaking, and peeling is common problems with film forming types of deck stains. The second category, penetrating deck stains dive deep into the wood below the surface resulting in very little or no surface film. A penetrating deck stain is not vulnerable to cracking, peeling, or flaking like the film forming deck paints. Oil based penetrating deck sealers do an outstanding job of blocking out moisture and shielding against harmful UV rays. This type of sealers will simply fade over time as opposed to peeling and cracking and is easier and cheaper to maintain. Penetrating deck stains are normally transparent to semi-transparent. They can have a tone or colored tint added to them meaning the deck can have a particular color or hue to it but still, allows the beauty of the wood grain to show through. A general rule of thumb is the darker the color of deck stain (more pigment), the more sun protection it provides. Choosing between a film forming deck paint or a penetrating deck stain is ultimately the choice of the homeowner. The important point to remember is that protecting the wood with at least some type of finish is better than nothing and will ensure you get years of use out of your deck.